For an average-sized rabbit of 8 pounds or so, you'll need a cage that's at least four feet wide, two feet deep, and two feet tall. The bunny should be able to lay down and stretch out comfortably and still have room for food and water and a litter box. Outdoor hutches for rabbits can be purchased or you can build one yourself. The hutch should have room for the rabbit to nest, hop around, space for food and water and a litter box. 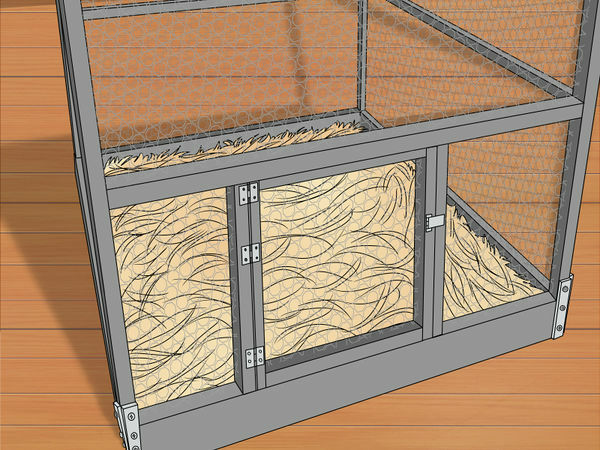 Get an exercise pen to provide extra space for the rabbit to move around. Big bunnies will need larger accommodations. The rabbit needs to be able to move around and lay down freely. 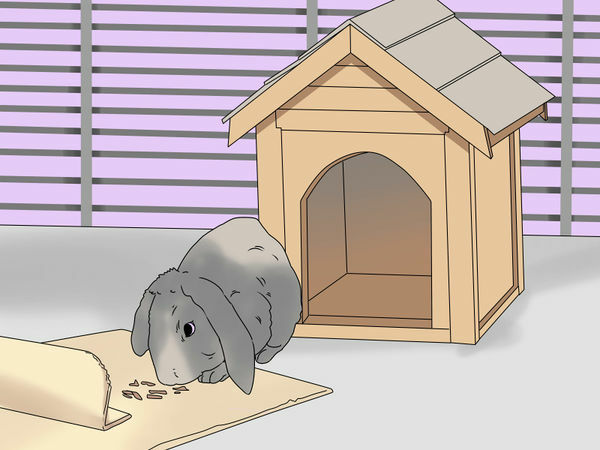 Make sure to have a large enough cage so that your rabbit can play! Some people do what is called "Cage Free Rabbit Housing." This is where you give your rabbit free rein of parts of or the whole house, just as you would with a dog or cat. 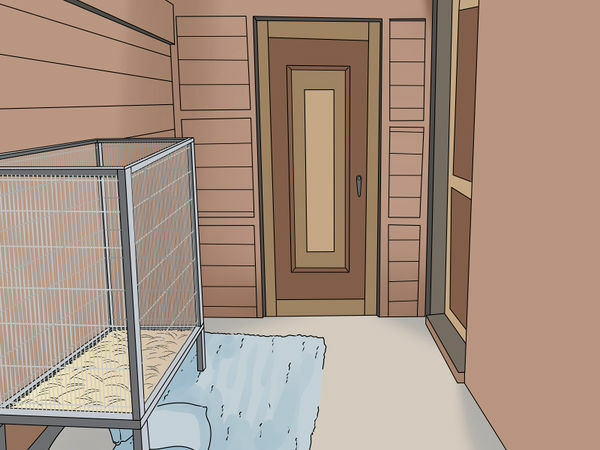 It is often considered the best housing type as they would have tons of places to roam and explore but does require bunny-proofing much more of your house and spending a little more money than simply getting a cage. 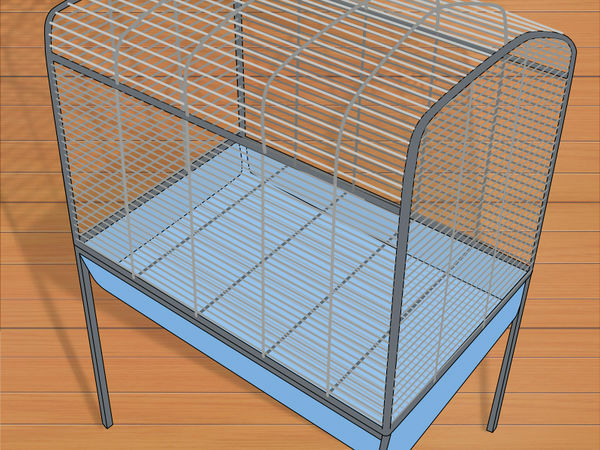 Look for a cage with a solid or wire bottom and sides made out of wire designed for rabbits. Think of this as the “den” for the rabbit to sleep in and a source of food and water. The plan should be that the bunny spends 8-12 hours or so outside of the cage in an exercise pen or a room for bunny-safe exploration. Wire flooring is actually much better than people make it out to be and doesn't hurt them to walk on. The ridiculous myth that it will always cause sore hocks is untrue. Rabbits can get sore hocks on any surface if not cared for properly and have even gotten it on fleece before. If they are cared for properly, sore hocks will not happen. 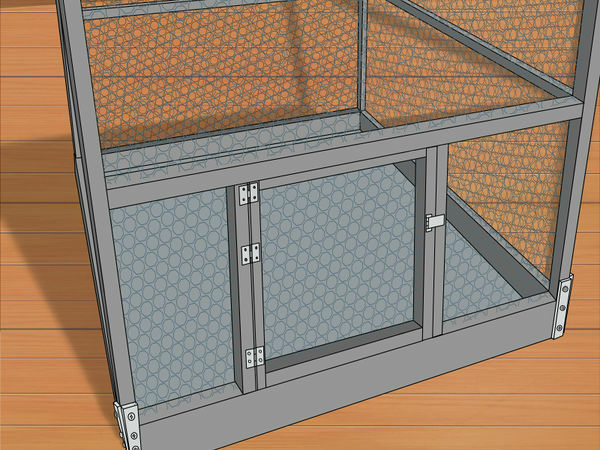 Wire floor cages have proper air ventilation, a place for waste to go, and are easier to clean. An outdoor hutch should be sturdy and provide protection from the weather and predators. You can buy or build a hutch. You will need to make sure the rabbits are protected from predators and the elements. Just make sure that the hutch is roomy- many people make the mistake of putting a rabbit in a small, cramped cage all day long! 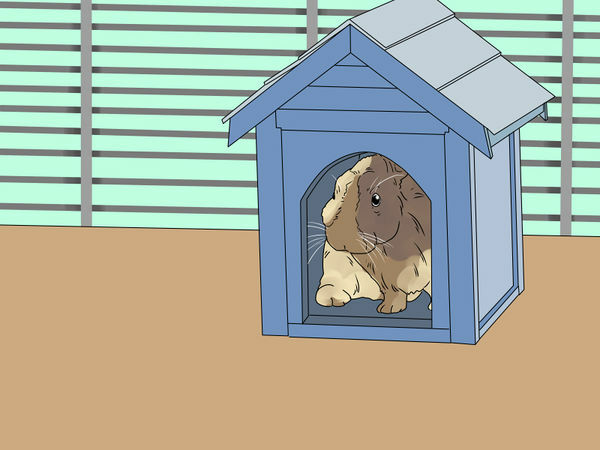 Do not house your rabbit outdoors in a hutch all by itself. Rabbits are highly social animals, so get a companion rabbit when they are both young and have the rabbits spayed or neutered. There are also some specialty beddings made of recycled wood pulp that work well. Rabbits like to make cozy nests, so fill the bottom of the cage with soft natural material to keep them comfortable. Hay, in addition to being great bedding, is the most important part of a rabbits diet, so make sure you choose the right hay for your rabbit. Timothy or grass hays are appropriate for rabbits. avoid alfalfa hay(only if your rabbit is over six months old) as it is too high in calories, protein and calcium for long term feeding for all adult rabbits. 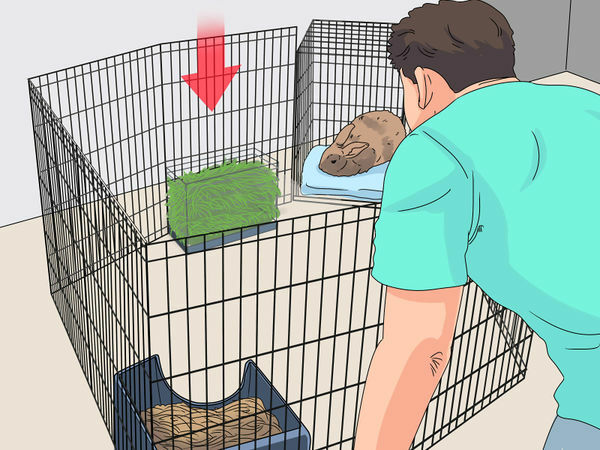 You'll want to be able to let your bunny out to hop around, so place the cage in a room that you don't mind sharing and that is safe for the bunny. For instance, remove all electrical cords, small objects, and furniture of value from the room and avoid having chemicals or plants that may harm the rabbit in the room. Rabbits like to chew cords but you can buy cord protectors from hardware stores to stop your rabbit from chewing them. Use a baby gate or exercise pen for dogs to prevent full access to the house to avoid damage to the furnishings and the bunny. 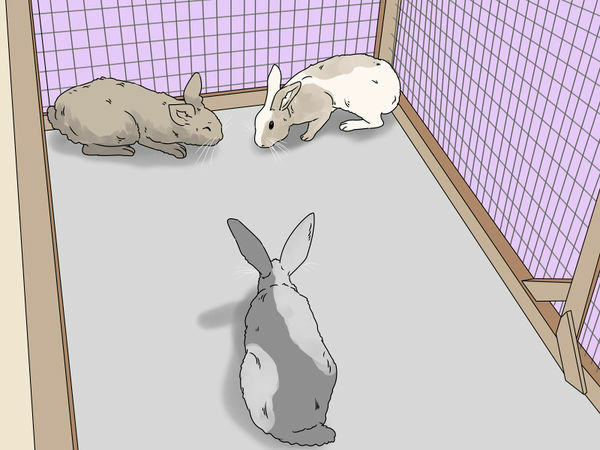 Rabbits will naturally use the same spot as a "restroom" over and over, usually one corner of the cage. Line a small litter box (available at pet stores) with newspaper, then fill it with hay, or litter made specifically for rabbits, and place it in the rabbit's preferred corner. Consider putting a second litter box in the rabbit's play area. Rabbits are burrowing prey animals, so providing hiding places, like logs or cardboard boxes, is good for their well-being. One or two per rabbit, depending on how much space you have, will give the rabbits plenty of room to huddle. Rabbits adore chewing, and it keeps their teeth healthy. If you don't provide rabbit chews as snacks, it may chew on your furniture or other items you have lying around. Make sure your rabbit always has something safe to chew on. This will wear down its teeth and prevent injury. This is the main component of a rabbit's diet and so it should be available at all times. Timothy, oat, and brome hay are good choices. Put it out on a daily basis in a clean area of the rabbit's cage. For young growing rabbits (up to 4 months) feed alfalfa hay and pellets to provide extra calories needed for these life stages. Dried ready grass hay is available from pet shops and feed stores or you can grow a tray of grass specially for the rabbit. These contain protein and fiber, essential for growing bunnies. 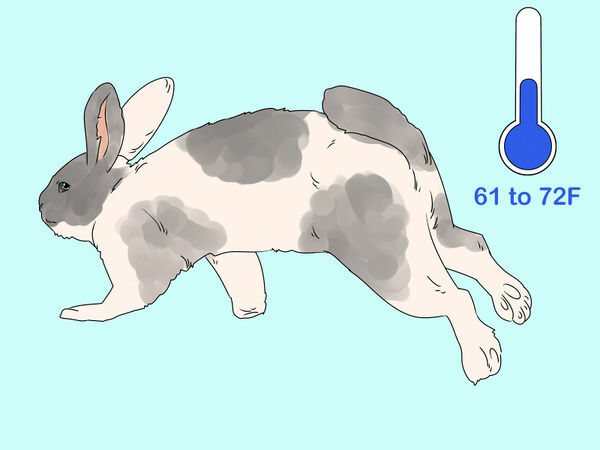 Adult rabbits should get 1/4 cup for every 5 pounds of body weight. Rabbits are herbivores and even hay and vegetables can make them gain weight. Pellets are more concentrated energy than hay and should be fed sparingly. Remember that your rabbit can't live on pellets alone. It is very important for the rabbit’s digestive tract to have long stem indigestible fiber in the form of Timothy or grass hay to prevent hairballs (trichobezoars) and to keep its digestive system happy and healthy. Chewing on long stem fiber also helps to wear down the rabbit’s continuously growing (hypsodont) teeth and prevent dental problems. Baby rabbits can have as many alfalfa pellets as they want until they are 6-7 months of age. Rabbits are famous for loving carrots, but these should only be given occasionally, as they have high sugar content. Wash the veggies completely and, if possible, feed organic greens. Provide leafy greens like spinach as well as collards and turnip greens. In addition, mustard greens, cilantro/parsley, watercress, celery, and dandelion leaves are good vegetables for your rabbit. Two cups of vegetables a day is a good amount for most adult rabbits. Introduce greens a little at a time to avoid digestive upset. Younger rabbits, 12 weeks an older, you can add in one veggie a week, about a half an ounce at a time to avoid disrupting the cecum. You can also feed your rabbit fruits like apples, blueberries, strawberries and bananas as special treats. Fruit is high in sugar, and should be fed sparingly, about 1 to 2 ounces per 6 pounds of body weight. 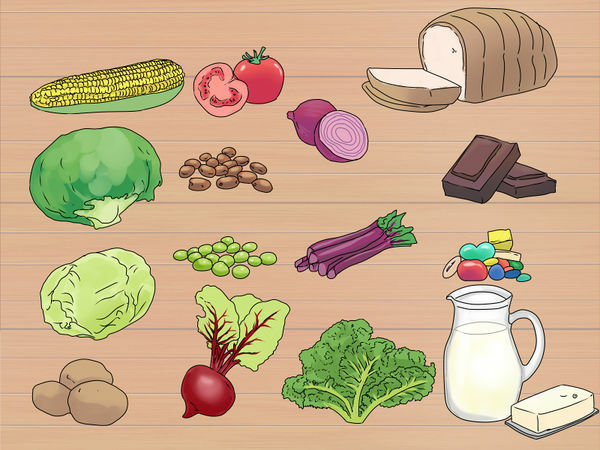 Some vegetables aren't good for rabbits, including corn, iceberg lettuce, tomatoes, cabbage, beans, peas, potatoes, beets, onions, kale, and rhubarb. 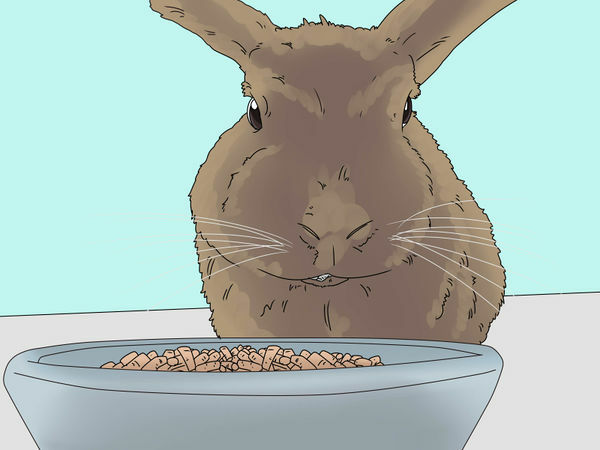 Also avoid feeding the rabbit with bamboo, seeds, grains, and any type of meat. 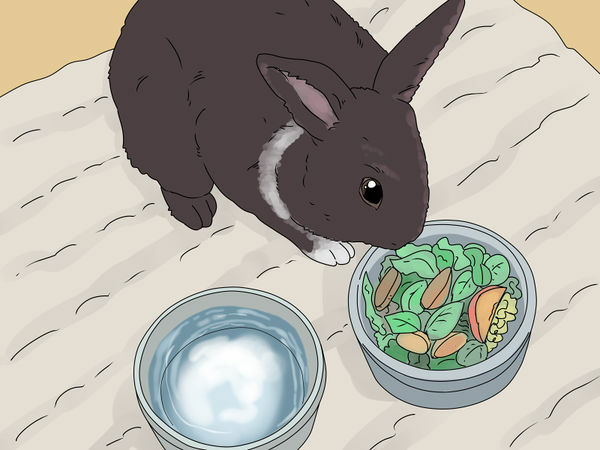 Human foods such as bread, chocolate, candy, dairy, and anything cooked should not be given to rabbits. Do not give your bunny light lettuce (such as iceberg). It may kill them by causing diarrhea and digestive upset of the good bacteria in the gut. Romaine is best, but make sure it's organic if possible, and wash it before offering it to your rabbit. You can allow a rabbit to eat grass that has not been sprayed with herbicides or pesticides and let the bunny choose what to eat on the lawn. However, avoid cut grass that has been heated and crushed by the mower. The process of cutting it will hasten the fermentation process and can lead to bunny digestive problems. Fresh water must always be available and changed daily. 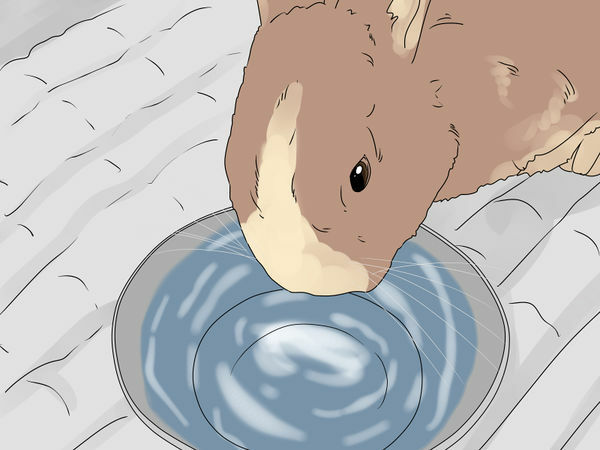 You can put it in a bowl or in a bottle of the sort used to feed hamsters, but rabbit size, although a bowl of water can be easily spilled. Make sure it never runs out and clean it out frequently to prevent contamination. Make sure, if using a water bottle, that it is working properly and is not stuck open or closed. When you first get a rabbit, leave it in its cage or hutch so it can get used to its home. Don't approach it straight away and start playing with it, as it hasn't really settled in yet and doesn't really know you and trust you yet. Approach a new rabbit slowly and calmly so the rabbit doesn't get scared. Rabbits get scared very easily and can't see very well, so you should speak before approaching. Rabbits love to hop and run around, and to stay healthy they need the opportunity to do so for several hours every single day. 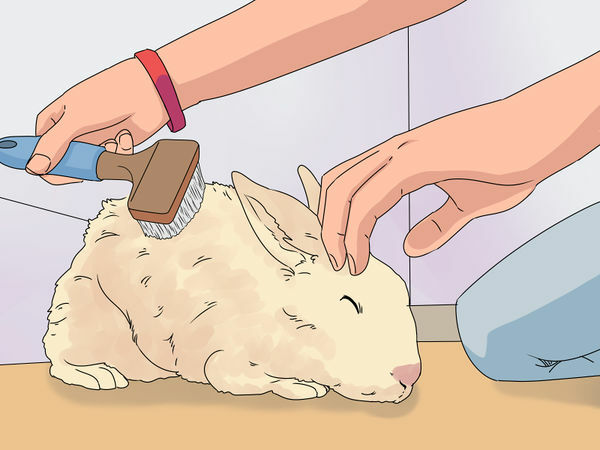 You can play with your bunny or leave it to enjoy itself on its own (but keeping an eye on it), but don't neglect this important element of rabbit care. 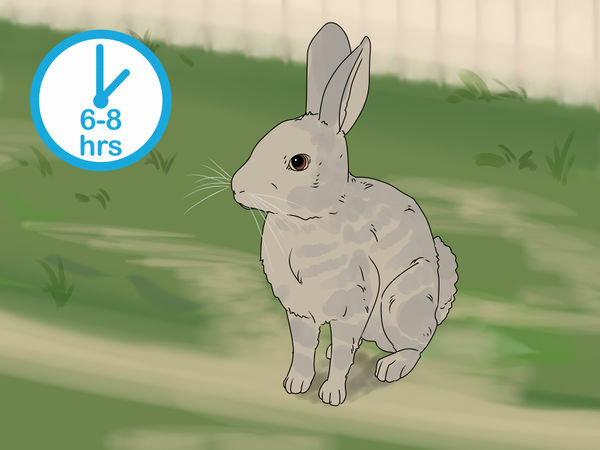 Make sure your rabbit is either fenced in a pen that is at least 1 foot (0.3 m) in the ground and 3 feet (0.9 m) out of the ground, or on a rabbit harness and leash. If you'd like to play with the bunny outside, make sure you're in a fenced-in area, and never leave it unattended. Keep cats, dogs, and predatory birds away from the bunny at all times. They like to chew up cardboard boxes and old phone books. 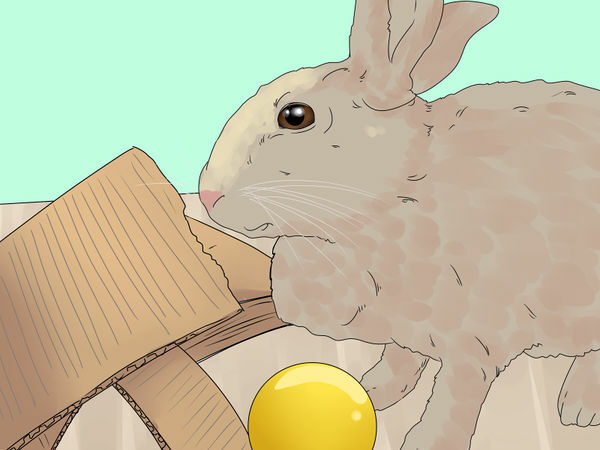 You can also try playing with your bunny by tossing a small ball or stuffed toy. Rabbits have fragile bodies and must be handled with care. Put a hand under its rear and front area and hold it close to your body. Never pick up a rabbit by his ears. Most rabbits enjoy being petted. 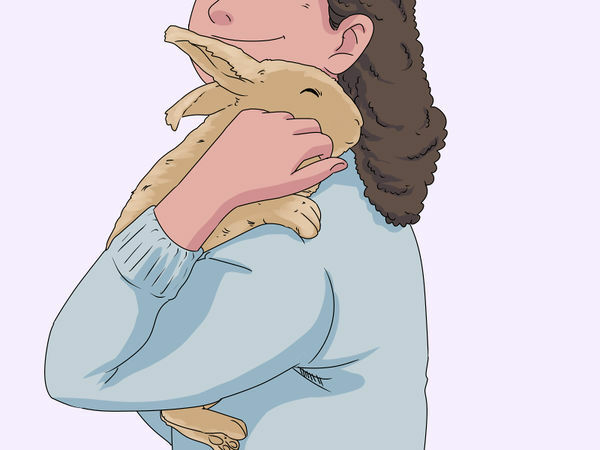 Don't handle the rabbit roughly or pet it when it is clearly not enjoying it. Rabbits get stressed out easily when they aren't comfortable. 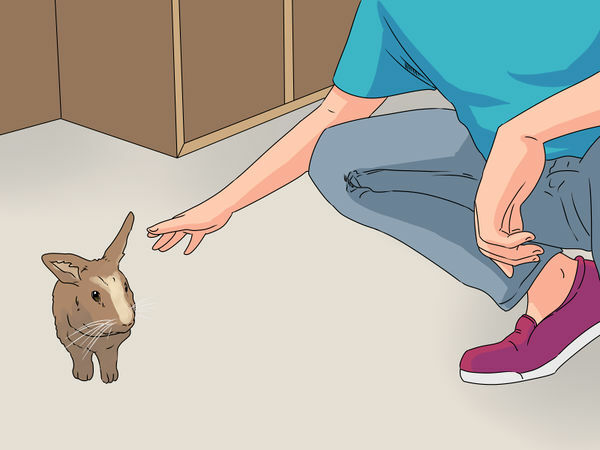 Bonding with your rabbits can be slightly difficult to begin with, as they like being given treats and a little scratch behind the ears occasionally, but much to people's surprise, a lot of the time they enjoy being picked up less. This is because (especially when you first get them) they don't like being taken out of their comfort zone and this can leave them feeling exposed. Don't be disheartened if at the beginning they bite and scratch furiously every time you try. It is like this for virtually every new rabbit owner. Remember to be gentle and calm, and don't get angry at yourself or the rabbit. Keep working at it, when you do it successfully, give them a small treat such as apple to let them know they have done a good job. 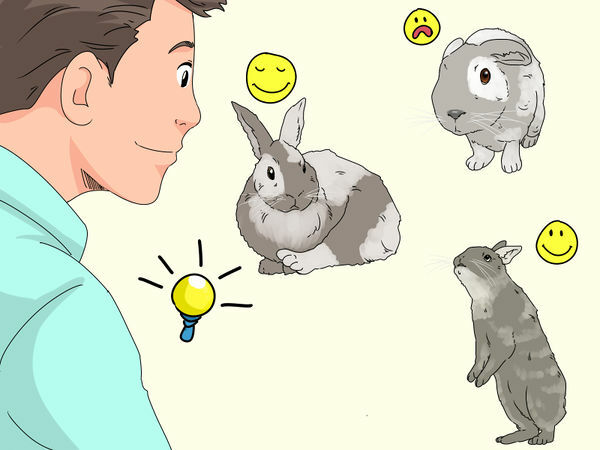 When you have bonded with your rabbits, interact with them as much as possible. This helps to build a happy and great relationship which is very rewarding as rabbits are curious and playful animals, and will give out as much love as they get back. Rabbits are social animals and they enjoy playing with other members of their species. Caring for two bunnies isn't much harder than caring for one, so you might want to invest in a second pet so they'll both be happy. Make sure the bunnies are spayed or neutered, especially if you're housing them in the same cage. Be sure to get one that is a good fit with the rabbit you already have. If you think you want more than one rabbit, get litter-mates at the same time so they are the same age and similar size. Have the bunnies spayed or neutered right away so you don’t have unwanted litters and you prevent some hormonally driven behavior issues. In an established household, you will need to introduce new arrivals slowly, to prevent fighting. Rabbits can be territorial. A male and female or two females will likely be easier matches than two males unless they are babies. Have the rabbits in cages far apart on neutral ground for a few days and watch what they do. If they are thumping and agitated, place the rabbits further apart or in separate rooms for a few more days and then bring them back in eyesight. This would be a good time, when introducing them, to have yummy veggies to distract the rabbits but also increase the positive association of the presence of the other rabbit. Gradually decrease the distance between the cages until they are next to each other, but still safe from “attack.” As long as they are peacefully co-existing in cages next to each other, continue this arrangement for at least a week. 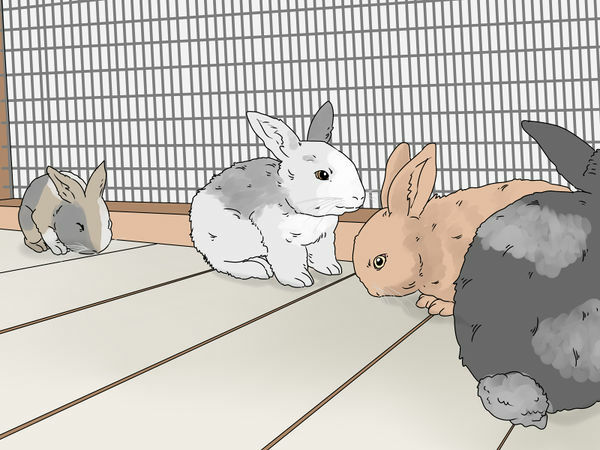 Then, you can place them in exercise pens with a barrier between them and, if all is okay, allow the rabbits to meet without a barrier, under supervision for a short period of time. Place yummy greens in there, two to three piles, to reinforce all is good. When rabbits are laying down together or grooming each other, bunny life is good. Make sure the bunny is under supervision while you work. 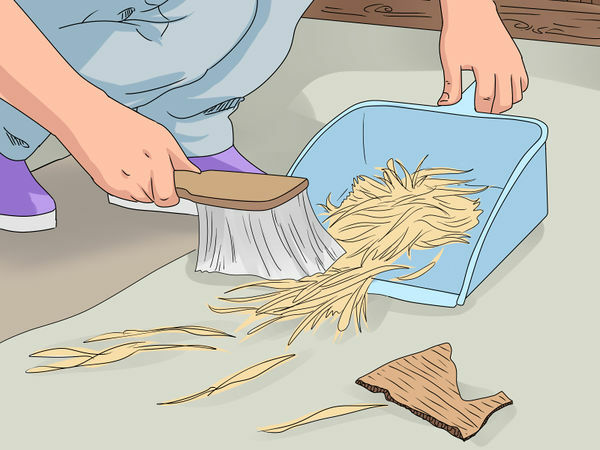 Empty the dirty hay or shavings from the cage, wash it with hot, soapy water, rinse it thoroughly, and let it dry. Fill it with clean hay or shavings. You should wash out the water dish or bottle every day. The litter box needs to be changed out every day and thoroughly disinfected every week or so with a 10% white vinegar solution. Rinse well and allow to dry. If the litter box is plastic or metal, you can also place it in the dishwasher. 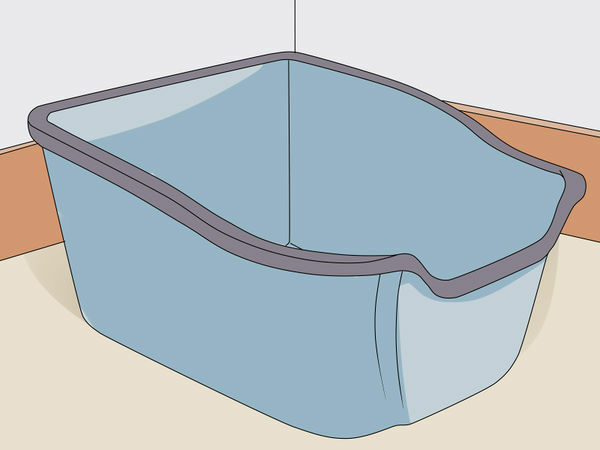 Have more than one litter box so that you can switch a clean one while the other box is dirty or in the process of being cleaned. Rabbit urine is very alkaline and crystals can build up on the surface of the litter box and require the use of a descaling solution. Optimum temperature for rabbits is 61 to 72oF. If your rabbit is outside, provide plenty of shade and, if it gets really hot, bring them indoors to air conditioning or place frozen water bottles in the hutch to help the rabbit keep cool. Rabbits can die of heat stroke. The rabbit’s ears are really the main temperature control part of their bodies. If they were in the wild, the rabbit would go underground where it is cool to get out of the heat. Bathing should never be done, but you can use a soft-bristled brush to carefully remove hair every day or two. If you have two rabbits, you may notice them grooming each other. Rabbits do not need to be bathed unless they get very dirty and are not able to groom themselves properly. 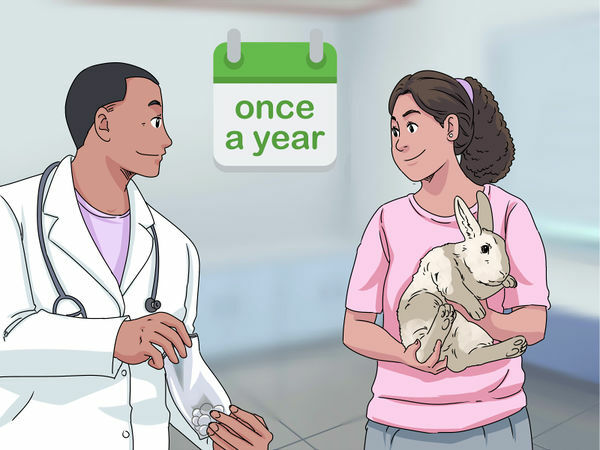 Rabbits need annual checkups to make sure they're healthy. 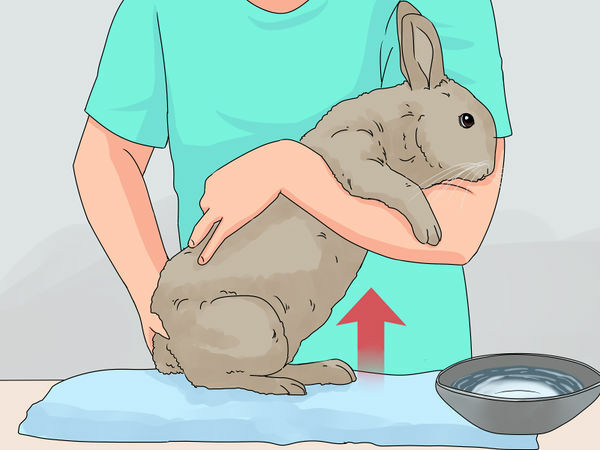 Many veterinarians who treat cats and dogs do not have expertise in treating bunnies, so you may need to find a vet who treats "exotic" animals. Depending on where you live, your veterinarian may recommend vaccination for certain diseases like Myxomatosis if you live in the United Kingdom. In the United States, Myxomatosis vaccination is not currently recommended. Your veterinarian will do an examination and discuss their findings and make recommendations based on your rabbit’s current condition. Managing healthy dentition in rabbits may require anesthesia to fully examine the teeth and address any sharp points discovered on the back teeth (premolars and molars). Knowing how your rabbit is feeling is extremely important if you want your bunny to be happy and healthy. If a rabbit's ears are flat on its back, its eyes are bulging and its body is tense and hunched up, it is scared. If a rabbit is really terrified, it may be trembling and breathing heavily. If a rabbit is very relaxed chilled out, it will be laying stretched out with its front paws in front of it, or it may have all its paws tucked beneath its body. It may also be laying on its side. Its ears may be flat on its back. Sometimes, when a rabbit is extremely happy and excited, it will jump into the air and flick its body. This is called a binky. Many rabbits will run around very quickly before binkying. Sometimes, if a rabbit is feeling lazy, it won't do a proper binky but will remain on the ground and do a sort of shuddery-flick.